Hanna is a Brazilian veterinarian that reached her dream of being a wild animal veterinarian since she was a little kid. 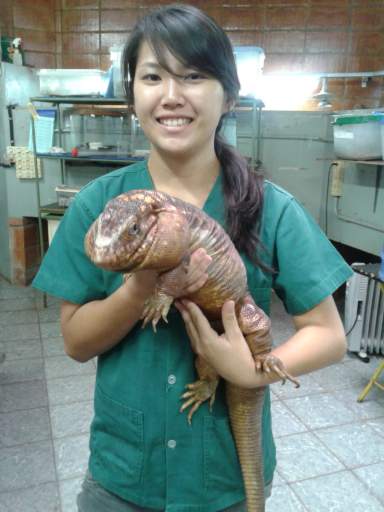 She graduated at vet school in São Paulo University (USP) – 2013, and went into the residency program at Sorocaba’s Zoo & São Paulo State University (UNESP) campus Botucatu to work with wildlife, zoo animals and exotics – 2014 to 2016. She also did externships with wild animals in her country and abroad. 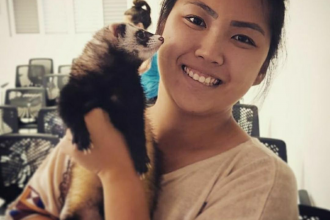 Since then, she works as a vet at a Rehabilitation Center for Wild Animals at Vale do Paraíba University campus São José dos Campos in São Paulo state, Brazil with wildlife that has been rescued from injuries and animal traffic, focusing on their return to wildlife. Her favorite animal is (guess what): Tapirs! But she is also fascinated with all other animals! And loves to talk about animals, watch TV series, books, play ukulele, or simply stay at home with her husband and beloved dogs (Tchuco & Giovana) and cats (Tantilla & Jessica Jones), enjoying the nature around her house.